Speed is a part of our lives in every field. Time is the real money. Nothing is as precious as time. We look forward to saving our time in all possible ways and finish with the desired work within the time limits. Most of our professional work and businesses are shifted online or connected to the web in one or other format. Be it for business use or personal entertainment we cannot compromise on the speed of the internet. Now the question arises on what factors the speed of your internet depends? 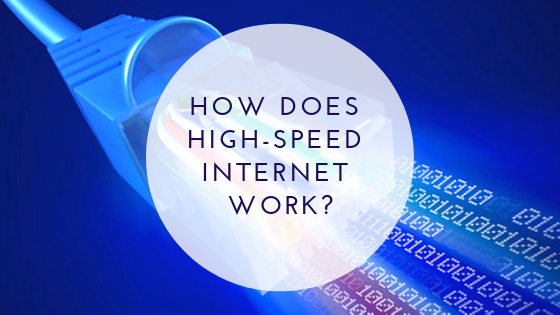 How is it determined and how does the high-speed internet work? In the earlier times, we had to completely rely on the wireline services. Later the introduction of WiFi changed the definition of internet connection. Now Pathfinder Internet Services allows you to choose a customised connection as per your requirement.if you want to have a high-speed internet connection and you do not know how does it work to check the blog underneath. Mostly when we connect to the internet services in a multiple user environment be it at our home or office, we look forward to the broadband connection. A broadband connection offers you a transmission speed of 1.5 megabytes to 2 megabytes in a second. This form of the internet works with good speed and reaches the user end from ISP with the help of last mile access. This method of internet connection is supported by the telecommunication network and has a modem at both the ends that is at the user end as well as the operator end. This internet distribution system is designed to give even access to everyone. The speed slows down only in some conditions. The condition can be either there are too many users or connections using a huge data or you have exceeded the per day data limit. Digital subscriber line is used by most of the people across the US apart from cable. This has been the preference of the users as you do not need any additional connection to connect to the internet rather you have an internet connection through an existing telephone system. DSL internet connection can be of two types that is SDSL and ADSL which refers to symmetric and Asymmetric Digital Subscriber Line respectively. In SDSL the upload and download speeds are equal and fast while in case of ADSL the download speed is faster than upload speed. Long-term evolution has given tough competition to cable and DSL broadband connection. LTE is a new advanced wireless technology that can give the same speed and an equivalent broadband connection to the users like that of Cable and DSL without any requirement of the landline. These services are provided by top companies in the US like Sprint, AT&T, T-mobile, Verizon etc. Verizon also avails the users with the much faster speed with the introduction of Volte. You can avail the internet connection by using just a modem or even with the help of your mobile phone. Another good option is to check out the tips to speed up your internet connection at SolidGuides. The speed of the internet also depends on the service providers and the connection you prefer. The serial technological advancements introduce the continuous increase in speed. Now continuous efforts are made to increase the speed with the introduction of 5G technology. Make sure you seek the plans as per your use at office and home to enjoy uninterrupted services.